If you have a sweet tooth, then you will go nuts (pun totally intended!) for these candied cinnamon pecans! There are just four ingredients and if you or your party guests (these make a great party nibble with drinks) have a sweet tooth they will be gone in seconds! They also make a fabulous homemade gift, just bag them up into cellophane bags and tie off with ribbon and a tag. This recipe is so simple and so delicious! 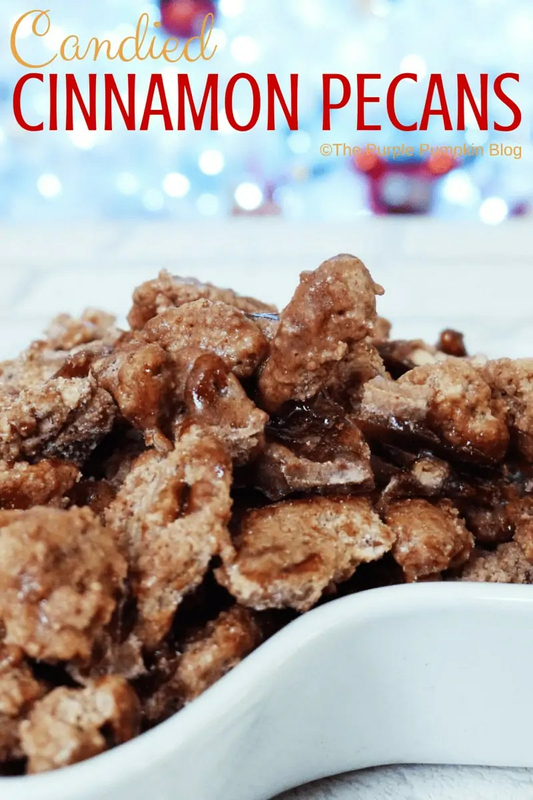 You may panic as you are stirring the pecans with the sugar as it goes very grainy – but this is supposed to happen, and suddenly you have these candied cinnamon pecans that are a real treat! Line a tray with greaseproof paper and set to one side. In a bowl, mix together the sugar, cinnamon and water. Pour into a frying pan on a medium heat. Gently bring to the boil and as it starts to bubble, add the pecans. Stir with a spoon to coat all the nuts, and continue to stir constantly to prevent the sugar from burning. After a few minutes, as the water evaporates, everything will turn grainy - keep stirring, this is supposed to happen! Once you are satisfied that you've coated all of the pecans well (about 5-8 minutes), pour out onto the prepared tray and spread out. Create Christmas is an annual series on The Purple Pumpkin Blog where I blog each day with something to cook, craft or create for Christmas. This year I’m also sharing a round-up post with ideas and inspiration from other bloggers. If you’d like to be involved, just check out the Calling All Bloggers post here. Don’t forget to check out the blogger Create Christmas Linky too!